CN says its police force will increase education efforts to keep railway crossings safe after some people in Burnaby climbed over a stalled train Saturday. CN rail says its police force will increase education efforts to keep railway crossings safe after some people in Burnaby climbed over one of its trains that was stalled for hours on Saturday. 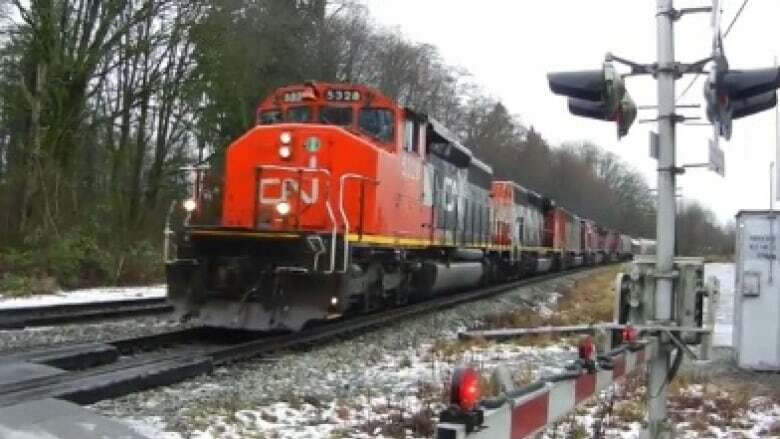 Jonathan Abecassis, a media relations director for CN, says the company is apologizing for the inconvenience caused when a train stopped across from Burnaby Lake at Piper Avenue due to a broken coupler, which took up to two hours to fix. "We understand their frustrations," Abecassis said about the fact people were stuck at the crossing. Some people however climbed over the train to bypass the problem, which Abecassis described as unsafe. "This behaviour is worrisome," he said. "We don't want people to think this is acceptable." CN says it is illegal and dangerous to walk on or along a railway track, which should only be crossed at designated, authorized crossings. Abecassis says the CN Police Service will increase patrols around crossings to help communicate how to stay safe. It will also conduct workshops with school children and recreation groups to advocate for safety around railway tracks and trains. The company has several hundred officers that patrol CN's 30,000 kilometres of track across Canada. Some were deployed to the Burnaby crossing at Piper Avenue on Saturday. CN Police Services can be contacted at 1-800-465-9239.